We have three on-site accommodation options for you. 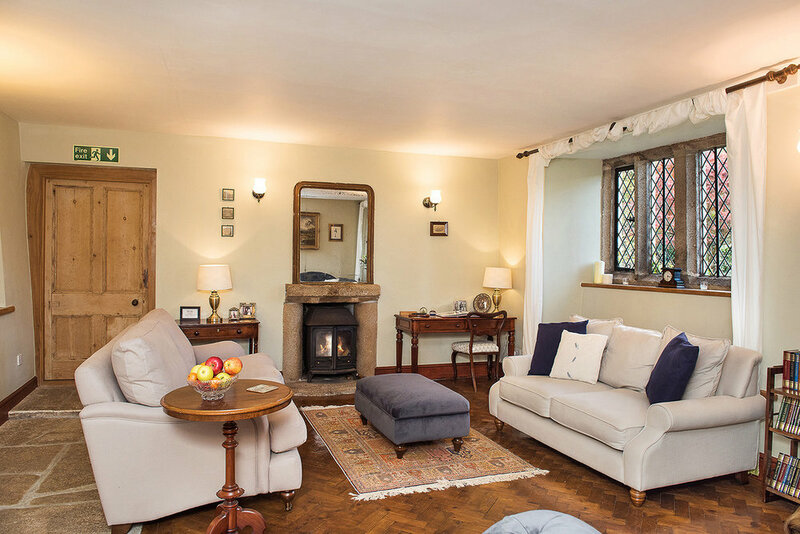 Inside the Manor there are 5 bedrooms sleeping up to 10 guests which are available on a luxury self catering basis with use of the entire house included as standard. At the end of the driveway there is a further 4 bedroom cottage called Watergate sleeping 6 adults and 2 children. Finally below the Manor by the river there are over 2 acres of camping meadows, available to all of your guests for FREE. OPTION ONE. The entire Manor house of five luxurious bedrooms, three bathrooms, Dining Room, Drawing Room, fully equipped kitchen and utility room are yours for the weekend. Be Lord and Lady of the Manor for the weekend! On the ground floor there is the downstairs cloakroom as you enter through the 450-year-old Elizabethan front door, the Drawing Room with gorgeous comfy sofa seating for 10 and digital Smart TV with complimentary Netflix, the Dining Room in the Medieval wing with its huge antique table seating 10, a newly refurbished fully fitted kitchen with Rayburn range and adjacent utility room, a downstairs double bedroom in the Georgian wing, and finally a downstairs shower room with rainfall shower. Upstairs via the spiral staircase the Bridal Suite is a lovely bright, spacious and south facing room that has been decorated in a glamorous Art Deco style with an adjoining luxurious en-suite shower room in the same style. Three further sumptuous bedrooms (two good sized doubles and one smaller twin bedroom) have shared usage of the spacious family bathroom with large bath and separate shower. 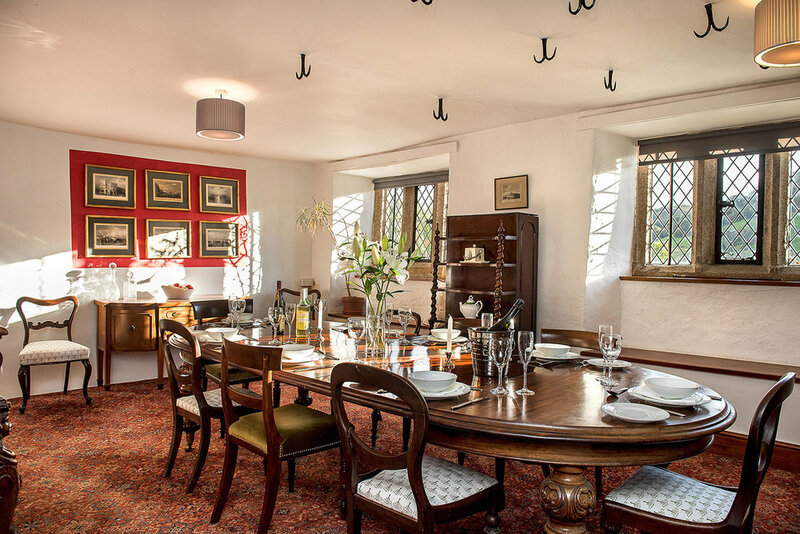 Each of these rooms have been individually decorated in a Victorian and Georgian country house style, with period furniture and other antique family pieces blending seamlessly with each rooms original architectural features. 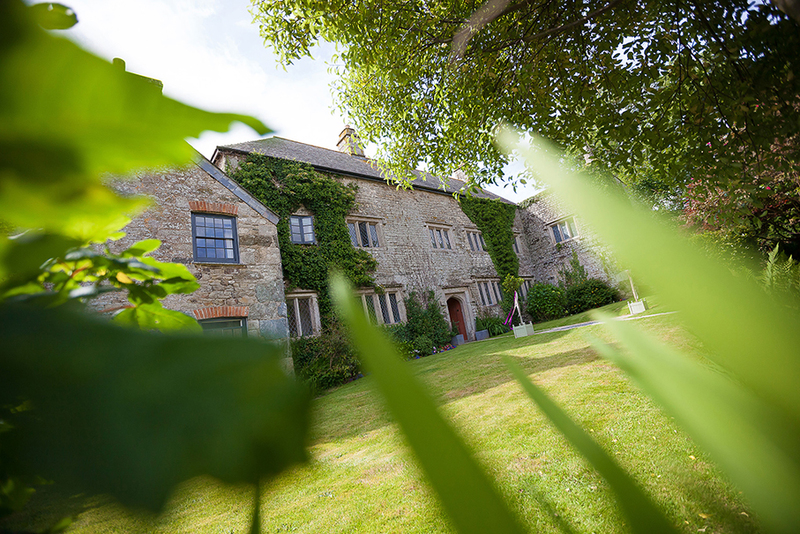 The accommodation inside the Manor is included as standard with our main wedding package. Click on any image on this page to view at a larger size. OPTION TWO. Watergate, conveniently just 5 minutes walk from the Manor, started life as 3 miners cottages for the Pengenna Lead Silver Mine Company Ltd in the 1870’s. Over its 150 year history the three cottages became one large home, and the small back gardens each cottage would have had were developed by various passionate owners (one of whom was a daughter of Sir Ernest Shackleton) into 3 acres of beautiful private landscaped grounds in the bottom of the valley divided by the same small stream that eventually runs through the meadows below Pengenna. Over the last year it has been extensively renovated and is now available for use by your extended family. The cottage today (which sleeps 6 adults and 2 children in bunk beds) is very light and airy, set on the valley side with the main windows having a southerly facing aspect. There are four bedrooms - the master bedroom with it’s brand new ensuite, a further double bedroom interconnected with a large bunk bedroom, and a twin bedroom, all serviced by the brand new family bathroom, and accessed via two staircases. The kitchen features a traditional Aga-style cooker, slate flooring and has a high vaulted ceiling with exposed A-frames. The dining room flows into the sitting room which is very spacious with three windows looking onto the garden. The living room beyond links nicely with the garden via French doors inviting you to go and explore. A wall of glass created by a series of windows provides lovely vistas over the lawns in this room. As well as the extensive 3 acres of grounds to explore there is plenty of off-road parking. Watergate is available at £950 for a weekend booking from Friday afternoon to Sunday morning. This can possibly be extended to a weeks stay on request for circa £2,500 - £3,500. It is generally available all year round, with the exception of the main school holidays at Christmas, Easter, and summer (late July and August) and half term breaks. OPTION THREE. You and your guests can also camp for FREE for the entire duration of your hire of the Manor in the two and a half acres of river meadows down in the valley below. Just a one minute walk from the Manor down through the trees these secluded meadows could help you fulfil your dream of a mini festival wedding with all of your friends on site for the whole weekend. It also has its own separate vehicle access allowing cars, campervans and caravans to be parked up. We can also link you up with one of our recommended glamping companies (such as www.pitchngo.co.uk) who can build you an entire glamping village throughout the meadows with luxurious bell tents featuring real beds with proper bedding, fluffy towels, wash stands and even a wood burning stove if you want one. We can then set up a fire pit with seating and help you organise for hot running showers and toilets to be installed. For the ultimate treat local company www.kernowsprings.co.uk could even set you up a wild spa with woodfired hot tubs and treatment tents! How amazing would that be?! Use of the camping meadows is included as standard with our main wedding package. For the rest of your guests there is a wide range of fantastic accommodation to suit all tastes and budgets in the area near the Manor. From cliff-top luxury hotels and seaside inns to holiday cottages, B&Bs and budget hotels there is somewhere to stay for you and all of your guests. Contact us to find out more. "We had our wedding here in September 2016, our day was perfect, who knew you could have the most fun on the wettest day of the summer! Richard was attentive and brilliant for the whole weekend and I would 100% recommend it to anyone thinking of getting married here, it's a blissful and peaceful haven!" Hannah & Liam, September 2016.